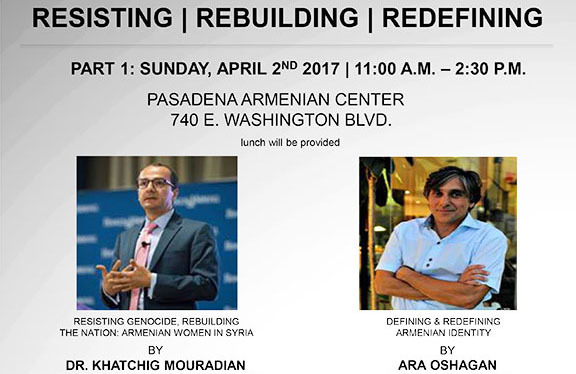 PASADENA, Calif.—The Pasadena Armenian Community Organizations Committee has organized a community-wide two-part event series entitled Resistance, Rebuilding, Redefining, which will take place on April 2 and April 9 with Part I taking place at the Pasadena Armenian Center on Washington Blvd, and ending with Part II at the Pasadena First Church of the Nazarene’s, Lee Chapel. 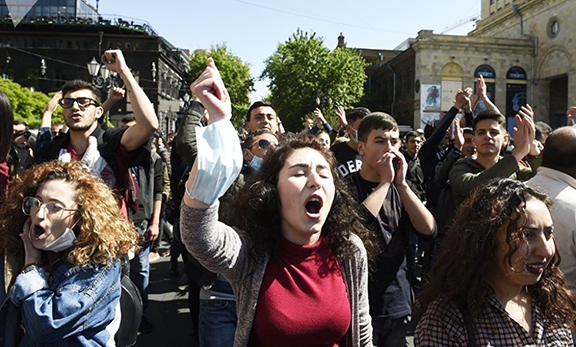 Both events have been organized as part of the upcoming commemoration of the 102nd anniversary of the Armenian Genocide. The struggle against Genocide and human rights atrocities is still present and prevalent today. Now, as in the past, the world is experiencing a contentious political climate where genocide is rife and subversive ideological strife common place. Genocides that have taken place in recent history have yet to teach us a lesson on humanity’s enduring willingness to commit evil and inability to live in peace with each other. In retrospect, hope is always there, in perpetuity, for a better and peaceful tomorrow. 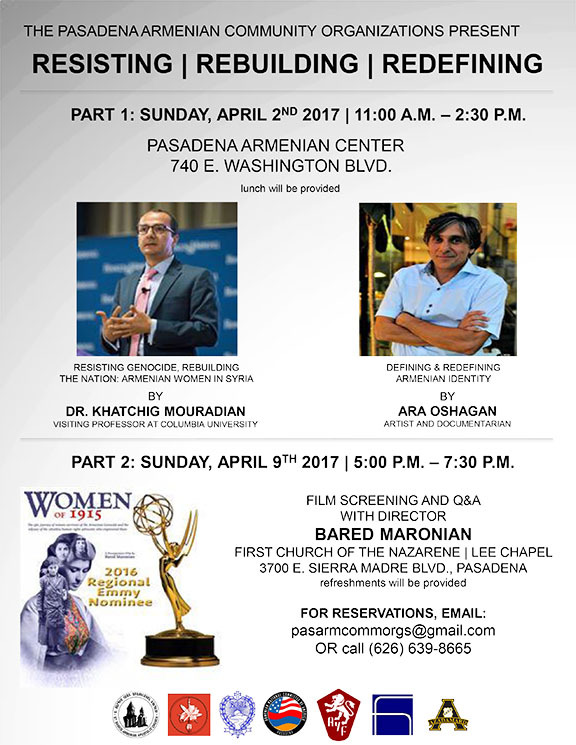 Part I of the series will take place on Sunday, April 2, at 11am at the Pasadena Armenian Center, located at 740 E. Washington Blvd. Pasadena, 91104. The morning session will feature a lecture presentation by renowned Armenian scholar, and currently a visiting professor at Columbia University, Dr. Khatchig Mouradian, who will present Resisting Genocide, Rebuilding the Nation and Armenian Women in Syria. After a brief lunch break hosted by the committee the afternoon session will feature a presentation by renowned artist and documentarian, Ara Oshagan, entitled Defining and Redefining Armenian Identity. 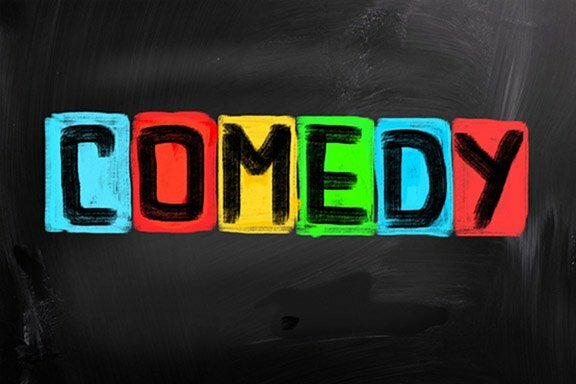 Part II of the series will take place on April 9, at 5pm, in the Lee Chapel of the First Church of the Nazarene located at 3700 E. Sierra Madre Blvd. Pasadena, 91107. The documentary film, “Women of 1915,” directed by four-time Emmy award winner, Bared Maronian, will be screened. A discussion with Maronian will ensue immediately after the film’s showing. For more information about attending this even, you can reach us by emailing PasArmCommOrgs@gmail.com or by calling (626) 639-8665. The Pasadena Armenian Community Organizations Committee is a collaborative effort comprised of St. Sarkis Armenian Apostolic Church, Armenian Cultural Foundation (ACF), Armenian Relief Society (ARS), Armenian National Committee of America, Pasadena Chapter (ANCA), Armenian Youth Federation (AYF), Hamazkayin Armenian Cultural Society and Armenian General Athletic Union and Scouts (Homenetmen).